Home Posts tagged "Cruelty Free Shop"
Nutritional yeast is a deactivated yeast, often a strain of Saccharomyces cerevisiae, which is sold commercially as a food product. It is sold in the form of flakes or as a yellow powder and can be found in the bulk aisle of most natural food stores. It is popular with vegans and vegetarians and may be used as an ingredient in recipes or as a condiment. 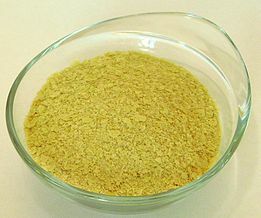 Nutritional yeast has a strong flavor that is described as nutty, cheesy, or creamy, which makes it popular as an ingredient in cheese substitutes. It is often used by vegans in place of cheese, for example in mashed and fried potatoes, atop of “scrambled” tofu, or as a topping for popcorn. You can buy it at almost any health food or vegan store. Such as the Cruelty-Free Shop, Braddon. Unfortunately Nutritional Yeast isn’t often available in mainstream supermarkets such as Woolworths or Coles. Freeda produce a wide range of supplements suitable for vegans. Their website claims their Vitamin D3 products are the only ones not suitable for vegans and to use their D2 supplement instead. A limited range of Freeda products are available at the Cruelty Free Shop!